After enduring a great season of trial and testing, Pastor Dameion L. Royal and Lady Melessha Royal were led by the Holy Spirit to organize Contending for the Faith Church Ministries. During his last year of pastoral ministry at St. Rose Church of Christ, the Spirit of God led Pastor Royal to teach from the book of Jude. In particular, Pastor Royal was arrested by the words of Jude 1:3 in which the writer admonished his readers to earnestly contend for the faith which was once delivered unto the saints. From this time forward, the words “contending for the faith” registered deeply within Pastor Royal’s spirit, and they quickly became the church theme. As a result, Pastor Royal spent the whole year referring to this text. Soon a banner was placed within the church and on it was inscribed the words “Contending for the Faith: God’s Soldiers Standing Without Compromise.” Amazingly, Pastor Royal never really entertained the idea that these words (Contending for the Faith) were being branded in his spirit for the purpose of birthing a new church movement. However, God had plans that were quite different and much bigger than anything that Pastor Royal had ever imagined! After having endured a long and toilsome court battle that lasted nearly two years, Pastor Royal was divinely released from his assignment at St. Rose by congregational vote. Though the headlines of the Wilson Daily Times on the next day would read “Royal Ousted from Church,” God boldly confirmed that He was in the midst of this whole situation all along! Pastor Royal had been released from his pastoral assignment at St. Rose on Thursday night, January 22, 2004, and it was on this very night that God showed him that the words “Contending for the Faith” were more than just a year’s worth of congregational teachings. This night, Pastor Royal would understand that “Contending for the Faith” would be the name of the new movement that God had called him to organize. After a final night of praise, food and fellowship at St. Rose Church, Pastor Royal announced his plans to continue the work of God in Wilson, NC! On the very next night, Friday, January 23, 2004, Pastor Dameion L. Royal and Lady Melessha Royal joined approximately 200 people at the newly constructed Darden Middle School to become the founders of Contending for the Faith Church Ministries. That night, Pastor Royal announced the name of the church (Contending for the Faith Church Ministries), and he asked members to prepare themselves to give into this new ministry endeavor. Quickly, God began to bless the church starting with the first twenty-five dollar donation that was given by Elder Carletha Ward to collecting over $50,000 within the first month of organizing. God continued to bless our efforts through our very own Elder Joseph Davis, who opened the doors to the Darden Middle School for our worship services. Though we were thankful for the use of the school, we knew that it was the will of God for us to purchase land and construct our own edifice. By God’s grace, in July 2004, we were able to purchase and pay cash for the land which we now enjoy at 1006 Academy Street. Upon securing land for a church building, we focused our efforts upon finding a bank that would finance our desired building project. After being told by a few banks that we had not been organized long enough to secure financing, we continued to forge forth in faith. Soon, God rewarded our confidence by blessing us to receive 1.3 million dollars from BB&T. In just a year’s time, God had shown us time and time again that His hand was upon this work! We went on to do a groundbreaking ceremony on January 2005 and construction began in early 2006! After holding services at Darden Middle school for two years, God blessed Contending for the Faith Church to complete its new edifice in October, 2006. On that Saturday, the women of the church worked diligently to decorate the building, and the brothers of the church held altar prayer all night long. The next morning, Sunday, October 15, 2006, Pastor Dameion Royal and Lady Melessha Royal joined the congregation and marched from Darden Middle School into this present building at 1006 Academy Street! That day, a praise erupted that has only gotten greater every year! As we reflect upon this journey, we have no doubts in our mind that God has brought us this far! The miracles that we have seen do not happen by chance! They are the works of a Sovereign God who performs mighty acts for His own Glory! From its inception, the hand of God has been upon Contending for the Faith, and we praise Him for thirteen years of awesome favor! Also, we wish to show great appreciation to every member who has joined Contending for the Faith within these last fifteen years! All of you will go down in history as individuals who helped to build this church in its formative years! May God bless you! • Many souls have come to know the Lord Jesus Christ. • Partnerships have been built with school and community organizations. Truly, God has been gracious to Contending for the Faith! We thank Him for his faithfulness over the years, and we look toward the future with great anticipation! Pastor and Lady Royal wish to extend their deepest appreciation to all of you who strive to make this local church better. They appreciate your dedication, prayers, and faithful support. Our leaders pray that we will continue to stand on the wall together and earnestly contend for the faith which was once delivered unto the saints! May holiness remain our standard! May the Word of God remain our foundation! May Jesus Christ remain our Chief Centerpiece! 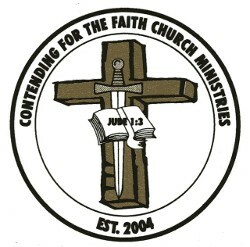 Today, we thank God for blessing Contending for the Faith Church Ministries over the last fifteen years! In this 16th year, we advance with great anticipation, knowing that our best days are still ahead. We vow to remain faithful to the cause of Christ. We will contend for the faith which was once and for all delivered unto the saints! To God be the glory!!! To carry out the Great Commission by winning the lost for Christ. To encourage spiritual, physical, mental and financial prosperity among professing believers. To promote spiritual growth throughout the united body of Christ through sound teaching, preaching and demonstration of the Word of God. To encourage and promote personal holiness and sacrifice to those professing Christ. To be an institution of Godly training and spiritual instruction that will encourage people to pursue God's perfect plan for their lives. To be a church that spreads, and contends for, the truths that have been once delivered to the saints in the Holy Scriptures. To build a multicultural and multiracial ministry that is consistently striving for excellence in God and manifesting His Kingdom in every place that God shall send us in the earth. To train, license, ordain, consecrate and install ministers and other church officers who exhibit the character and call of a particular ministry. To promote the cause of Christ throughout the world, to win the lost, encourage the weak and bring the saints to maturity in Christ. God holds under-shepherds accountable for establishing proper church order. Although Pastors need help in maintaining God's order, they are given the responsibility of establishing the local church upon the Word of God. Pastor's are entrusted with the task of the under-shepherd for God's sheep. People should obey by submitting because Pastors must give an account over your souls. If members do not submit, they put their souls in danger. Pastors cannot shepherd people who refuse to acknowledge the teaching they bring. Those who are not teachable have rebelled against the Word of God. Every part of the Christian life ought to exemplify Christ and be governed by His Spirit. God gave sacrificially and expects the same of us. Giving is a means of worship, and true worship takes sacrifice. There must be a willing mind when giving. Giving must be purposed in the heart and should not be done grudgingly, reluctantly or forced. Giving should be done cheerfully. Giving is a faith walk and an obedience issue. God desires us to trust Him as our Chief Supplier. Tithing (ten percent of gross) is the minimum standard of giving in the New Testament Church. The purpose of the tithe is 1) for the upkeep and building of God's kingdom, 2) for God's servant who labers in the Word and 3) for the poor and needy. 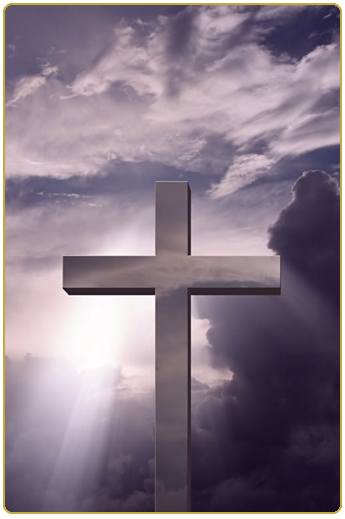 God sent his only begotten Son, Jesus Christ, to die on the cross for our sins. Buried in a borrowed tomb, Jesus was resurrected (raised from the dead) on the third day with all power and is now seated at the right hand of the Father. These sacrificial and obedient acts make the free gift of salvation available to all who call on the name of Jesus. We are saved by grace through faith. Faith alone in Christ alone! Holiness is a lifestyle. As a believer, it is the way in which we ought to live daily--set apart for divine service. The Word of God states "Because it is written, BE YE HOLY; FOR I AM HOLY" (1 Peter 1:16). To please God, holiness is required out of his people. The development of spiritual disciplines is vital in a Christian's life to become and remain victorious. These disciplines are reading, studying and meditating on the Word, fasting, praying, praise and worship. 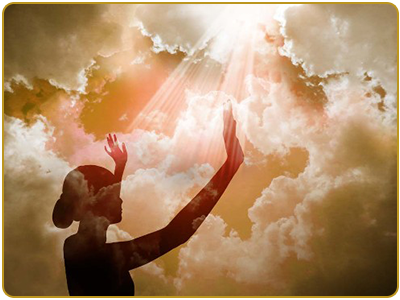 All spiritual disciplines are a form of worship that strenghens the believer in his walk with the Lord. Private time in the presence of God must take priority at all times. Just as a baby out of the womb eventually becomes an adult, a babe in Christ should not remain in its infancy stage for the rest of his life. The babe in Christ should reach the point of readiness and desirability for the greater things of God (moving from milk to meat). Healthy growth implies we advance from faith to faith, glory to glory and strength to strength. All we do is WIN, WIN, WIN!